Email voting? Why not, one might ask?! A lot of folks use the false analogy of online banking to argue that email voting should be allowed for the convenience and accessibility of voters. Not a moment of thought is given to the security risks involved. So I’ve done a brief Fact Sheet summarizing the major arguments against returning voted ballots via email. I’m OK with distribution of blank ballots via email but not the return of voted ballots by the same method. I recently wrote to my state senator about NPV. Thank you for responding to my previous communication. I hope you will reconsider your position and withdraw your support of what has been called the “Blue State Suicide Pact”, aka National Popular Vote proposal. Oh, the anguish of electronic voting… did that vote actually count? Did the dancing electrons inside that voting machine actually record that vote? Or did that vote disappear into the maw of the voting machine never to be seen again? Only Diebold and ES&S know for sure — and they’re not telling. Will the VRA survive the Supremes? Oregon has been leading the way in providing access to disabled voters and has just announced a new enhancement that will address the needs of visually impaired voters — large format ballots (LFB). Many voters with vision problems simply need larger type sizes on the printed page rather than electronic voting devices called DRE (Direct Recording Electronic) machines. Much ado is made about the increased participation of the 18-25 demographic in this year’s election but their participation still lags behind that of other age groups. Here are several ways to change election law to make their participation easier. Allow 17-year-olds who will be 18 by the General Election to also vote in the Spring Primary Election. This way their voice can be heard during a contested party primary when excitement is high and they are motivated to participate in support of their candidate. Maryland already has made this a part of their election law, largely because of the efforts of a 17-year-old student who wanted to vote for Barack Obama. Allow all voters, including high school and college students, to register to vote up until the close of polls on Election Day. Young people are often in transition during the run-up to election day — starting college, moving to a new city, starting a new job — and often do not pay attention to an upcoming election until the deadline for voter registration has passed. A handful of states (Wisconsin, Maine, New Hampshire and Minnesota) already allow Election Day Registration — and report the highest voter turnout numbers in the country coupled with virtually no problems with voter fraud. 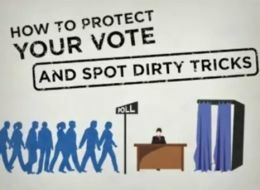 Rock the Vote, Project Vote and similar voter registration outreach efforts have done outstanding work but are frequently hampered by state election laws. If the five simple changes recommended above were to be enacted in all 50 states, their job would be much easier because they would be filling a much smaller gap and we would not have so much handwringing about the low rate of participation by the 18-25 year old demographic. Because he refused to prosecute bogus “voter fraud” cases in New Mexico, U.S. Attorney David Iglesias was fired by the Bush Administration. A dyed-in-wool Republican, Iglesias was disillusioned by the politization of the DOJ under John Ashcroft and Alberto Gonzales.